It was a successful weekend. We just listed The Workshop and the market’s response was amazing. We had many showings, great feedback, and best of all, a couple of offers! Everyone who went through the house loved the renovation. The extra effort put into the garage and landscaping paid off. Even as we go into the Fall season we can tell that the market is not cooling down. Renovated single-family houses priced under $500k continue to be in high demand. At this point in the process our contract is fully ratified and we are waiting for inspections to be completed. With the quality work that was completed, we’re confident that the house will pass with flying colors. 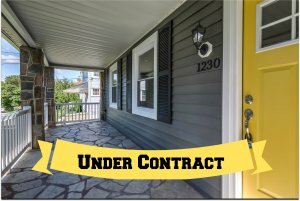 The contract is contingent upon the buyer selling her current residence, but that contract looks strong and the buyer’s house has no more contingencies remaining. Having The Workshop Flip under contract feels great. We’re nearing the end of our project pipeline and are now looking for more properties. We currently only have one flip in progress in Baltimore’s Dickeyville neighborhood. We have about four weeks left on that project and can’t wait to post the final pictures. If you are thinking about selling your house or buying a home, we’re ready to get started right away. I recently read a book written by Grant Cardone called The 10x Rule. Some of you are probably familiar with the author but for those who aren’t, he’s basically the Tony Robbins of business. I’ll be honest, when I first heard him on a BiggerPockets podcast I thought he was a lot of hype with very little substance. I locked away the ideas of “massive action” as a fluff nicety. This was until recently when we ran into yet another good acquaintance who had listed their house with another agent because they forgot we were Realtors. Now, we could have stepped back and placed the blame on the acquaintance. “How could they not remember we were real estate agents!” But that would just be us shift the blame from the real problem, our inability to market beyond average. Thinking back to the idea of, “massive action,” I picked up the book with a new perspective. These clients who found a different real estate agent weren’t doing so out of spite, it was purely due to our inability to step up and be great marketers. These shortcomings are unacceptable and cannot continue for us to meet our goals. We will be taking massive action over the next 3 months to iterate, improve, and eliminate these weaknesses. If you’ve read this far then you’ve obviously invested yourself in the success of AE Home Group and we honestly thank you. We encourage you to comment on this blog entry additional areas in which we are average. We’re at an all-hands-on-deck time in our company’s growth and your feedback (and criticism) would mean the world. Thank you!